We are proud to announce we have two more trailers in the livery of the Great North Air Ambulance. Hawthorns Logistics now has a total of seven trailers supporting the charity. They send us the artwork and we use Ace Graphics to print and fit them. We took delivery of our first ever Volvo this month. It’s a Volvo FH4 540. Supplied by Volvo Truck and Bus Centre North. 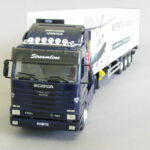 We have decided to compare the Volvo against the fleet of Scanias that we operate. 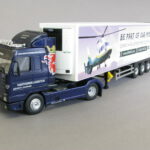 We have released some limited edition model trucks to raise some money for two extraordinary charities, the Great North Air Ambulance and the Dragonfly Cancer Trust. The Great North Air Ambulance runs three air ambulances depending solely on the support of the public. Without the public’s help, they would never be able to offer the life changing saving support of getting people who have sustained life threatening injuries to hospital for treatment quicker than you would ever be able to get them there by road. 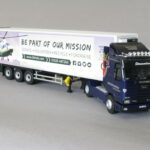 The money raised by the sale of the model trucks goes fully to the Great North Air Ambulance to help them continue to offer the support they do. The Dragonfly Cancer Trust supports young cancer patients with very limited time helping families and young couples create precious and lasting memories together. The charity provides Cash Gifts and organises Dragonfly Dreams for children and young people up to the age of 24 years old throughout the UK. This allows families to use what little time they have left together to make lasting memories that they can forever hold dear to them. Alike the Air Ambulance models, all the money raised by the sales of the models will go fully to the Dragonfly Cancer Trust to help them offer this life changing experience. Heather, our daughter, was married in June and turned up to the reception in our 24 year old restored Scania 143! Josie’s Dragonfly Trust makes a very real and positive difference to the lives of young cancer patients with limited time. They passionately believe in the importance of happy memories and work tirelessly to make them happen for young people and their families. Hawthorns Logistics are proud to support such a fantastic cause by supplying two trailers in full livery. Keep your eye out for this latest addition to our fleet! We have purchased five Laurence David 4.7 metre trailers that have gone straight into work liveried up in Labone Castleside’s logos. We are very proud to announce that we have won a tender to supply logistics for Labone Castleside Ltd, a plastic moulding specialist. We were chosen to be their partner and supply 5 trailers delivering to major car manufacturers with just in time deliveries. Labone Castleside will celebrate their 50th anniversary this year. We have commissioned a model truck to raise funds for the Great North Air Ambulance (GNAA), which has been limited to 105 pieces. They are available from the GNAA shop online or direct from ourselves with all proceeds being donated to the GNAA. “One of our lads was on the A1 near Belmont when a motorist lost control of his car and crashed into him”, he said. “Being on the roads a lot, we are obviously aware of the work of the air ambulance, but when you see it up close you realise just what an important job it does”. 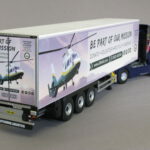 Hawthorns Logistics will support GNAAS by decorating three of its trailers with the message, “Be part of our mission”. “It’s a tremendous gesture by Chris and the team at Hawthorns Logistics for thinking of us and for arranging for this to be done, at no little expense”. “As a charity, we are reliant on the support of the public to continue to exist, so promotion like this is incredibly valuable to us. We hope people will see the trailers and consider supporting us in some way, perhaps by donating, maybe by volunteering”. To donate or volunteer for GNAAS, please visit the Great North Air Ambulance website.